The health reform law changed the way Medicaid and CHIP determine eligibility for most beneficiaries to align with how eligibility for premium tax credits is determined in the Marketplaces. All three coverage programs determine a household’s size and income using tax rules. 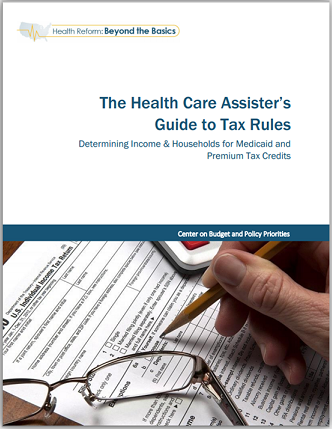 The Center on Budget and Policy Priorities developed The Health Care Assister’s Guide to Tax Rules to familiarize people who are helping consumers apply for Medicaid, CHIP and premium tax credits with the tax rules that are applied in determining eligibility for these programs. The guide explains the basics of who must file taxes, different filing status options, rules for claiming tax dependents, rules for determining Medicaid and CHIP households and how these rules differ from rules for premium tax credit, as well as what sources of income are considered taxable and therefore counted in determining Medicaid and premium tax credit eligibility. The guide is meant to give health care assisters a basic understanding of these rules to help guide discussions with applicants.